NewFoundry demonstrated the depth of our ongoing strategic partnership in delivering “Innovation from Renesas” at DevCon 2015 last week with a Big Idea branding initiative and the release of three applications that highlight the future of silicon technology. 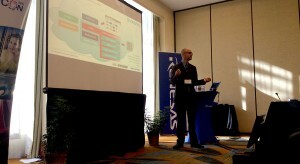 Renesas is recognized as the innovation leader in silicon for the automotive space and beyond. 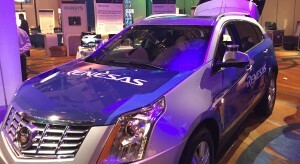 From Advanced Driver Assistance Systems (ADAS) to infotainment to cloud-based development ecosystems, Renesas is defining the horizon for the next generation of vehicles. This vision of the future is precisely what inspired us when we created the Skyline brand as a way for Renesas to package and communicate the advances and innovation by Renesas. The Skyline name, its corresponding visual identity, interactive style guide for Renesas and its partners, and web experience for all followers of the developing technology provide the focal point and tool kit necessary to bring Renesas’ Big Ideas to life. rSkyline.com is an interactive website that captures the ultimate proof point for advanced implementation of Renesas silicon in a car. Designed as a working development sandbox, it highlights the critical components that are leading to the advancement of vehicles. Through Skyline, users get an inside look at realistic features in hardware and software that enable Renesas’ partners and customers to build a production system in less time and with more confidence. One such feature is Renesas Skyline Fleet, demonstrating integrated technologies that form the key building blocks for safe, high performance Driver Assistance Systems and Autonomous Vehicles. Technology highlights demonstrated live at DevCon 2015 included sensor fusion, surround view, V2X (communication between vehicles and with infrastructure using DSRC radio), and mobile app monitoring. Another innovation featured on rSkyline.com is Renesas Skyline Cockpit, a demonstration of the platform that highlights dozens of automotive use cases for infotainment and instrument clusters while remaining open for significant differentiation by automakers and suppliers. Represented on a simulated car interior at DevCon 2015, Skyline Cockpit includes support for three embedded displays along with detached rear seat tablet integration. A single “R-Car H2 system-on-a-chip” processor delivers the performance needed to operate the complete interior system. Skyline for iOS is the mobile app companion to the technology exhibited at DevCon 2015. 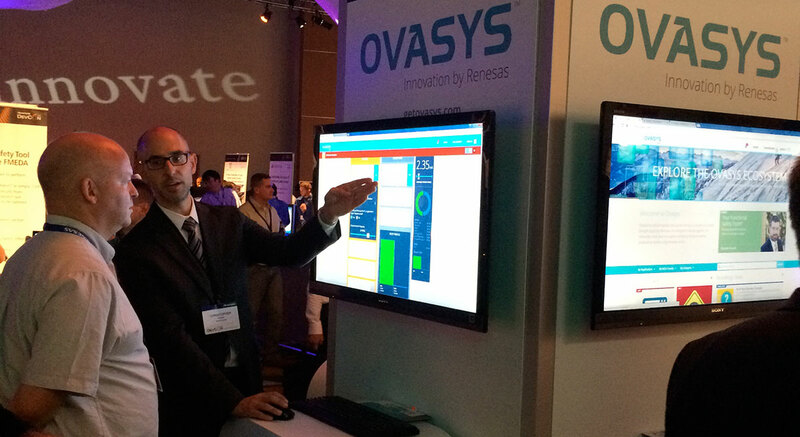 The app walks the user through Ovasys, the new cloud-based go-to-market ecosystem we are building in strategic partnership with Renesas, planned for full launch in early 2016. The Skyline app also provides a complete overview of Advanced Driving Assistance Systems (ADAS); Infotainment, which gives a detailed look at the future of in-vehicle infotainment; and Skyline Timeline, which allows users to follow Renesas innovations as they happen. getovasys.com is a microsite that provides further information about Ovasys and offers users a way to either join the ecosystem as an embedded software engineer or to engage in the process of becoming an Ovasys integrated partner.